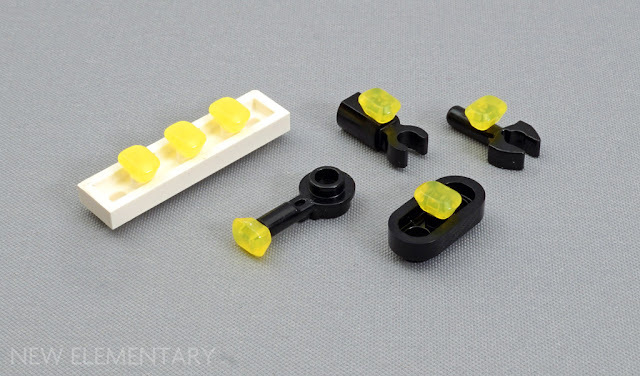 The thin 1.5mm bar on the back of the stones allows them to be connected to an ever-increasing range of parts featuring the matching little hole. 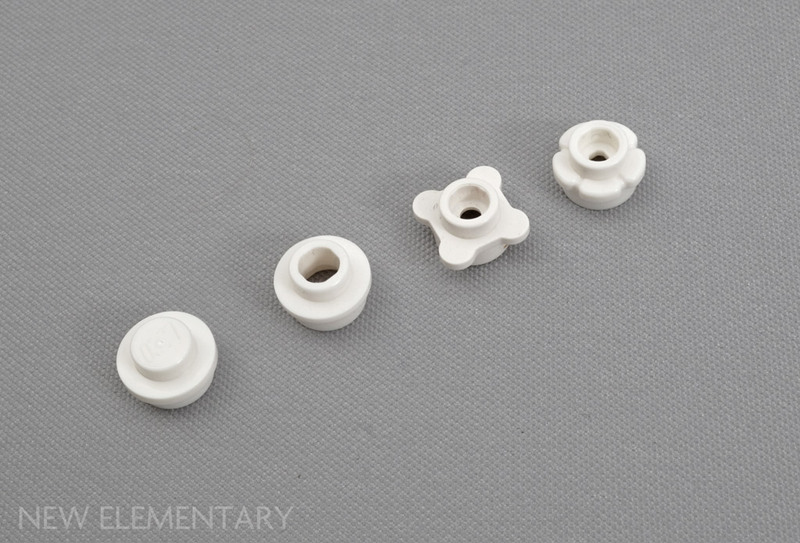 I am happy to see them supplied in fours on a sprue because aside from the individual stones, it also allows them to be used both as one large part or the sprue can serve as a piece in its own right, like this perfect fit around round profile bricks. The 1.5mm bar also just about connects to one of the other new parts provided in my selection: the new flower stud in White (Element ID 6209683 | Design ID 24866). This part adds to a nice little family of 1x1 round studs. 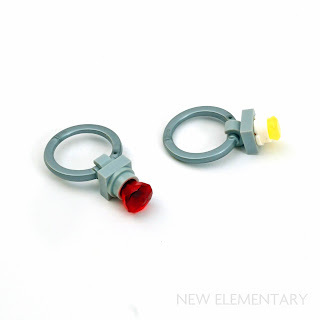 Combine these with this new circular minifigure accessory – some sort of Chakram weapon – in Silver Metallic [TLG]/ Flat Silver [BL] (Element ID 6207840 | Design ID 35485) and a 1x1 tile clip, and you have a nice piece of wearable jewellery (as long as your fingers are slim). I have made an alternative with a large ruby too, as modelled by my partner Sharon. I also got some spooky spiders in White Glow [TLG]/ Glow In Dark White [BL] (Element ID 6218845 | Design ID 29111) and a new mould leaf/petal/bract in fetching Medium Lavender (Element ID 6210460 | Design ID 32607) so I have made a little nature scene. The 1.5mm hole in the 1x1 flower stud allows the bush technique I have used here. It could be expanded to make bigger plants and adapted to different designs. 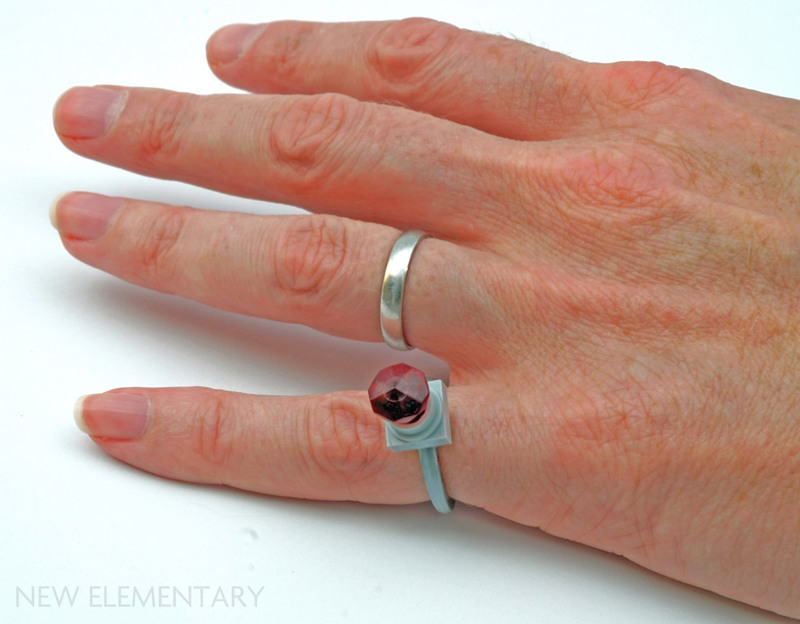 Of course you could do this with the old equivalent 4-petal piece (Design ID 33291). 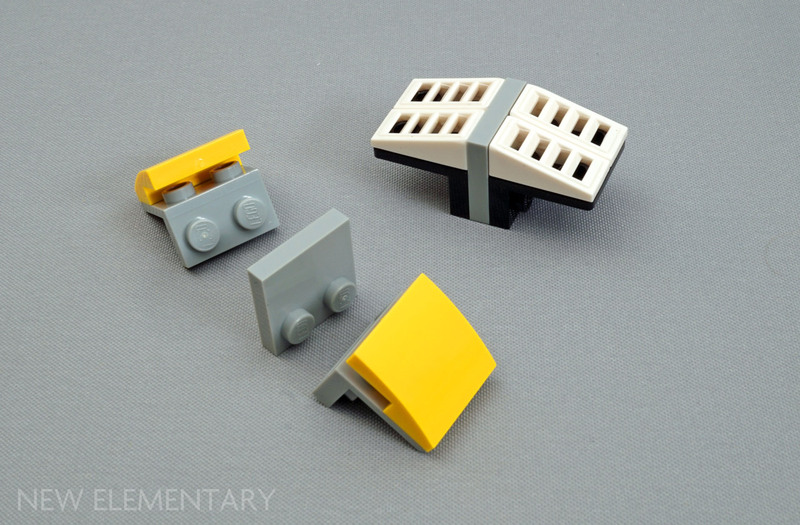 Next, a little diversion tablescrap using a part introduced in 2017, the 2x2 plate with 2 studs (Element ID 6212077 | Design ID 33909) which, with the help of opposing brackets, can be used to add a line between plates, tiles or slopes. 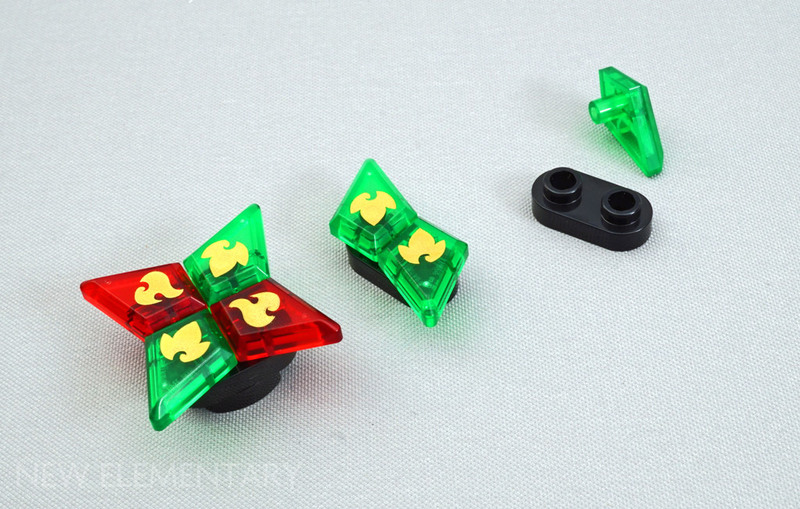 Included in the selection was a couple of different diamond shaped pieces which have a bar at the back, from Elves sets. There are four colours available but I received a Transparent Red one with flame print (Element ID 6213349 | Design ID 36710) and a green one with leaf print (Element ID 6213354 | Design ID 36713). They tessellate rather nicely on the short 45° sides but I couldn’t find a perfect fit with any other parts along the long sides. 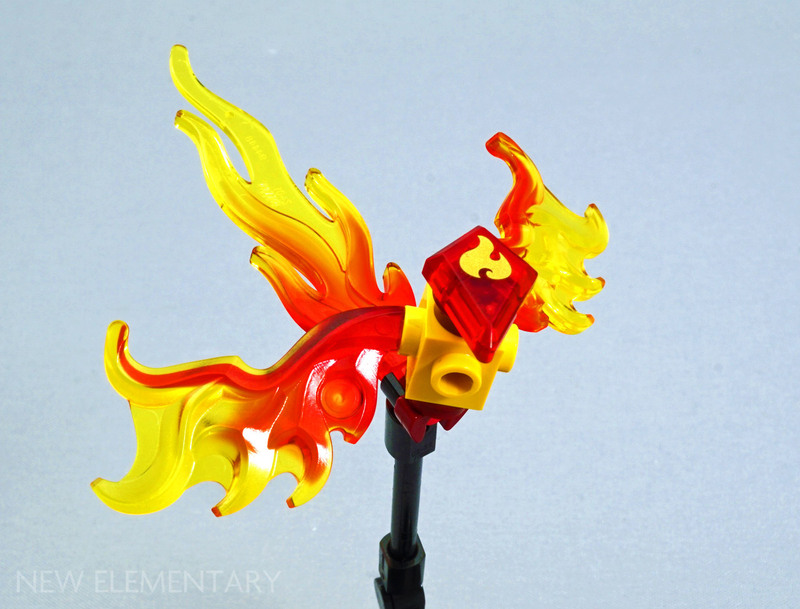 The shape made me think about using the part as a head which led me to rise a phoenix up from other parts in my collection. And so on to another animal using two other new 2018 moulds: a Nexo Knights weapon in Transparent Bright Green (Element ID 6205442 | Design ID35042) and a minifigure neck bracket with four bar attachments in Black (Element ID 6215458 | Design ID 36452). The neck bracket is surprisingly hard to use in a model; the neck hole has almost no clutch meaning it needs to be held in a vice-like grip. Read more about it here. As tricky as the neck bracket was to use I thought I would try it again, this time in something vaguely Ghost in the Shell inspired. 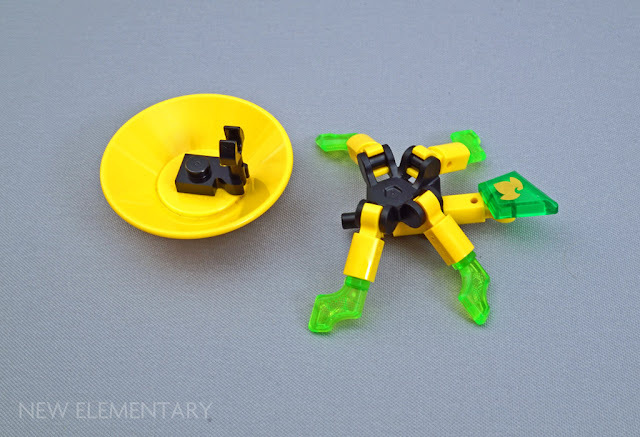 The metallic spider piece (Element ID 6208782 | Design ID 35039) used around the eye is another new Nexo Knights part that was included in my selection. 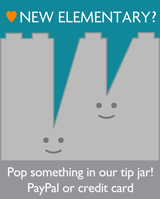 See more uses of it here. 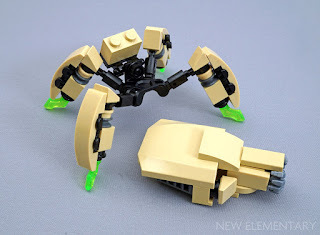 Tim will be back with more builds soon. They do give you three extras, which is the first time I can recall them intentionally handing out more than one extra of any element, barring instances where multiple numbered bags each got one extra of the same element. Frankly, there are other similarly tiny elements (possibly smaller, possibly not) that I'd be more concerned about losing since they didn't actually hand out any extras at all. My sealed copy of 79000 Riddles for the Ring came with 2 extra gold rings. Great blog! Keep it going! 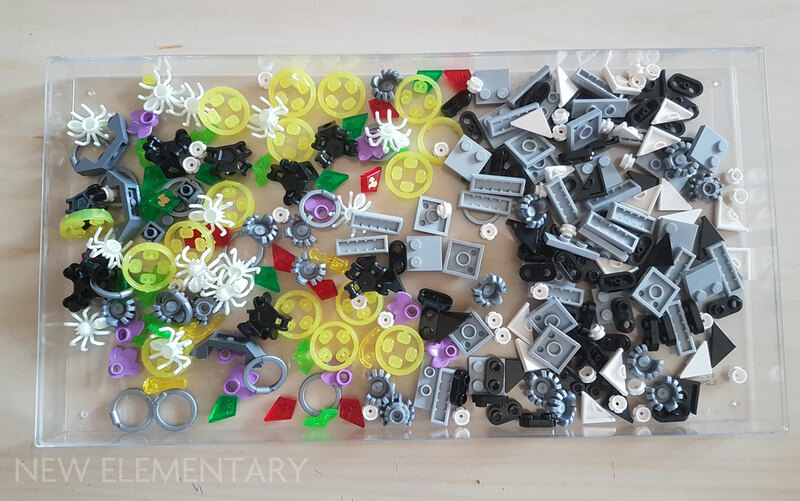 Okay, without a lineup shot to go by, it looks like there's 17 elements in this selection, if you count the Infinity Stones and the sprue as one. Did I miss anything? Of the leftovers, the powerblast seems the hardest to incorporate into a build, and the other four are relatively mundane compared to some of the other parts in this assortment. I think they only shape I'm missing out of the leftovers is the inverted double-slope, but I've used some of the 1x6 version before so I have a pretty good idea of how that one works. The powerblast can make interesting lights on a vehicle. I tweeted months ago an example of how to tesselate the diamonds along their long sides. It requires any two diamonds that meet on the long side to have a 1/2 stud offset on the Y axis and a 1.5 stud offset along the X axis (or vice-versa) and a 180-degree difference in angle. At the time I created this I only had 4 of the diamond pieces from Noctura's Tower, but it didn't seem like there were any part collisions that would be an issue if you were to continue it. At the time I did it, the only way I could think of to make it work was to use 1x1 round plates with hole arranged on a plate both on and between studs. 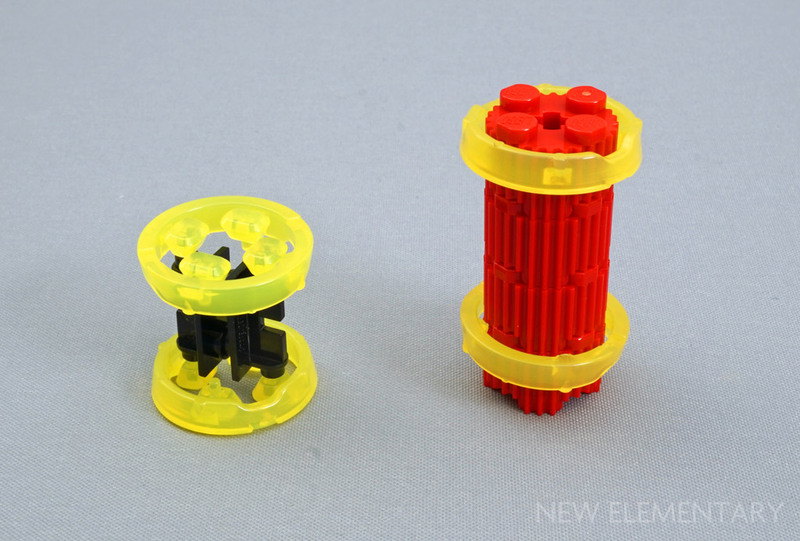 But looking at it again, you could achieve the same spacing with fewer parts by using diagonal strips of 1x3 jumper plates, alternating between the jumper plates in each individual strip facing horizontally or vertically. 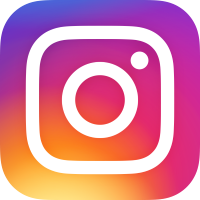 Whoops, I forgot to include a link: https://twitter.com/SkyeBarnick/status/964966126030610432 And I gues because Blogger synced to my new e–mail address my name didn't show up (this is Skye Barnick/Aanchir). Have to figure out how to fix that. 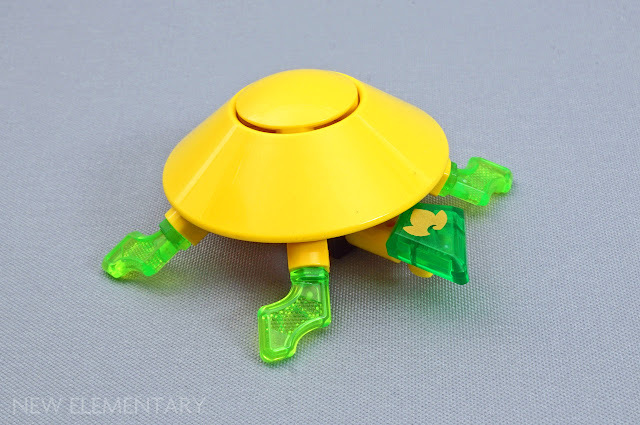 Both the Infinity Stones and the unprinted versions of the diamond plate strike me as having great potential for Bionicle eyes (the latter is incredibly easy to integrate with Technic or CCBS parts, and the former comes in six colors from the get-go while being slightly harder to integrate). I'm hoping to pick up more of both in the future to experiment with.